On the night of April 15th, 1912, the great ship, the RMS Titanic sank beneath the freezing waves of the North Atlantic. As the ship went sank further and further down, the water slowly broke into different parts of the ship and flooded her. However, for the longest time as she sank, her passengers remained blindly confident of her durability, and refused to believe that the great ship, who was supposed to be unsinkable, really was sinking. When the water began to enter the more prominent passenger areas, that is when people really began to realize that there was indeed a problem, and they were about to possibly face their deaths. That’s when everything changed, and now women were more willing to climb into those tiny lifeboats. When the water was causing the RMS Titanic to sink, it began to invade the parts where the passengers were gathered. One place was the Grand Staircase, and at one point, the water crashed through the dome over the top of it. 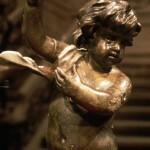 Water came rushing down the stairs of the Grand Staircase, and at the bottom of the A deck staircase sat a bronze cherub. 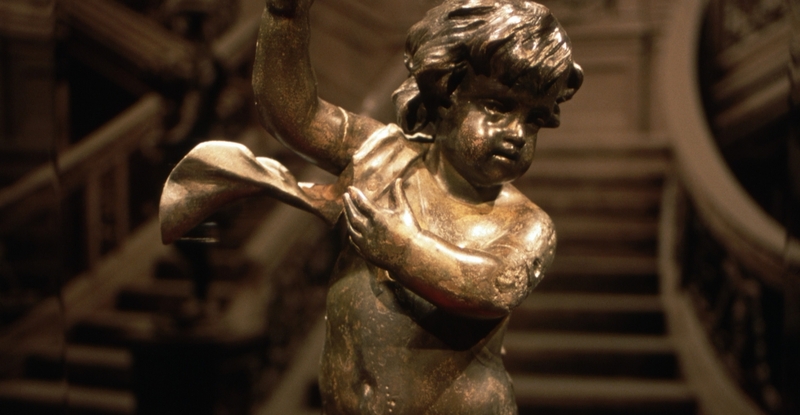 There is speculation that people began to panic as the water came in, and someone may have grabbed onto the base of the cherub as the water began to fill the room. 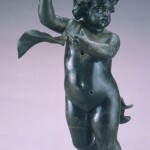 One foot of the bronze cherub was attached to the base, and the fact someone may have grabbed onto it might be what caused it to come loose from the base. 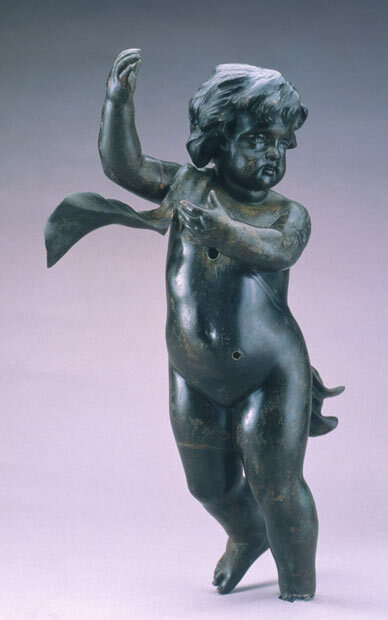 Years later, the beautiful cherub would be found in the debris field at the bottom of the ocean, and brought to the surface for conservation. The Luxor in Las Vegas, Nevada has been the home for the Titanic Artifacts Exhibition for years now, and this is also where the Big Piece, which is a 15 ton piece of the ship itself, is located. The exhibition has a replica of the famous Grand Staircase, but on a much smaller scale than the original one that was on the Titanic. For the past two years, no other artifacts have been added to the Luxor exhibition until now. 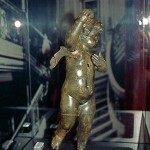 The famous small bronze cherub angel, that sat at the base of the staircase on the A deck, and now it is part of the Luxor Exhibition for the next few days. This is a rare opportunity for people to see this special little angel, because it does not go on display often, and it really is quite a sight to see. The night the Titanic went down, the ship broke into two pieces, and then sank about 2000 feet apart. 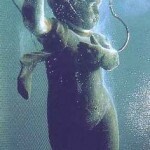 Because the ship broke apart, the items that were inside of it ended up all over the bottom of the ocean floor. In 1985, Bob Ballard and the Woods Hole Institute expedition went to find the Titanic, and after almost two months at sea, they succeeded. Bob Ballard returned to the Titanic’s resting place a year later, and had submarines that could reach that ocean depth, and he wanted to go down there to see the grand lady face to face. On the second attempt, Bob Ballard, in his submarine, made it to the resting place of the RMS Titanic. It was quite a shock to see the world’s biggest ship up close and personal. Ballard was able to explore the bow, and then crossed the two thousand feet over to the stern to see what that looked like as well. 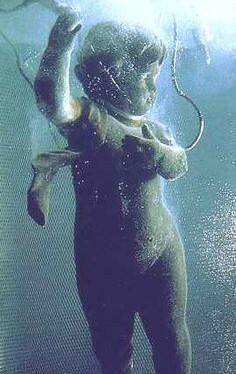 In between the bow and stern is a debris field, and that is where Ballard photographed the cherub statue lying in the sand. However, Ballard left everything alone, because he did not believe in bringing anything up to the surface. 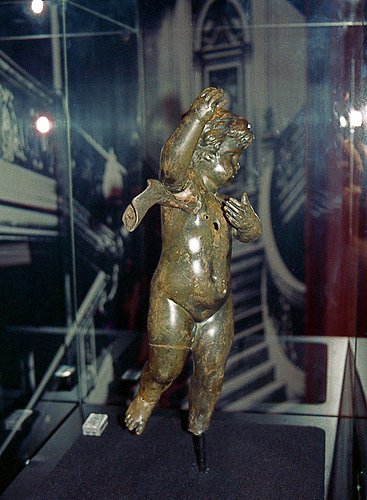 It was not until one ears later, in 1987, that another expedition took place from the company RMS Titanic, Inc, and many pieces from the debris field were retrieved including the bronze cherub angel.